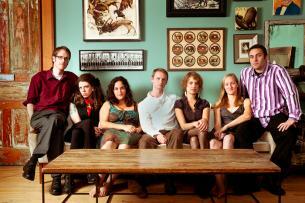 Jonas Friddle is a Chicago-based “orchestral folk” group is comprised of a string section, brass, organ, banjo and drums. Each member of the Majority boasts a strong personal music career with close ties to Chicago’s Old Town School of Folk Music, where the band formed.Jonas Friddle’s passion for old-time style banjo from his native North Carolina leads to rhythmic and rolling compositions. Following the example of new folk groups like Crooked Still, Abigail Washburn and Old Crow Medicine Show, Jonas looks for a new take on an old sound.